MODE SWITCH Different modes for the various assistance systems can be selected using a mode switch on the left side of the handlebar. It's very simple and intuitive: "up" and "down" through the menu selection, select the desired menu item with the left button, confirm it with the right, job done! CHASSIS With its ultra-lightweight yet extremely stable tubular space frame, the high strength, die-cast, open-lattice swingarm and high quality suspension components from WP Suspension, the KTM 1190 Adventure meets all requirements for stability and controllability. Spoked wheels - tubeless, 19-inch up front; 17-inch at the rear - fat tires and employment of appropriate suspension travel optimise its talents on the asphalt. 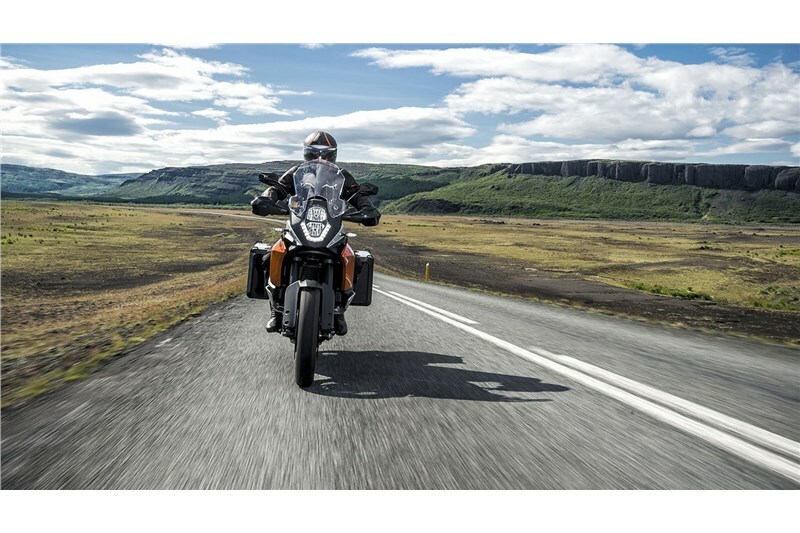 Unrivalled braking from world market leader Brembo and assistance systems (MSC with MTC and lean-sensitive C-ABS), developed in close collaboration with Bosch, round off the package and help the 1190 Adventure into a clear lead straight from the start in terms of ride dynamics and safety. Top-quality components from high-class suppliers are assembled to create the 1190 Adventure's chassis. They combine the pure riding pleasure typical for KTM with the best possible feedback and maximum safety. 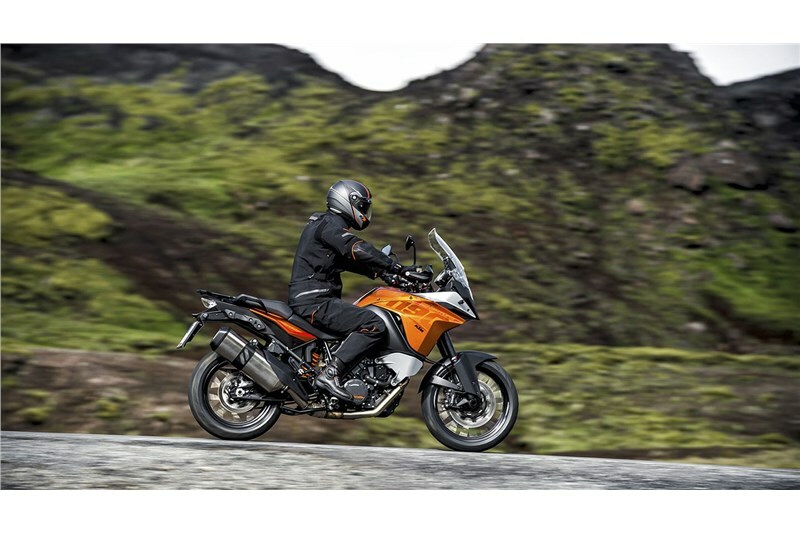 TYRES New standards demand new tools: The 1190 Adventure is the first ever travel enduro to roll on state-of-the-art, extremely grippy and durable tires sized at 120/70 ZR 19 and 170/60 ZR 17. EDS (ELECTRONIC DAMPING SYSTEM) Fine tuning of the suspension can be achieved with the factory fit EDS (electronically adjustable suspension) package. By using the handlebar mounted controls, the rider can adjust the spring preload of the front and rear suspension to four pre-defined settings (solo, solo with luggage, two-up and two-up with luggage) – providing the perfect geometry in all situations. In addition, the rider can also choose between three comfort settings of the suspension damping (comfort, street and sport) – according to their preferred riding style. SWINGARM The die-cast, open-lattice swingarm is not only particularly light and stable, it's also very precisely manufactured, with a design optimized in terms of flexural behavior and stiffness. TUBELESS SPOKED WHEELS Wire-spoked wheels for tubeless tires featuring airtight rim beds patented by KTM. 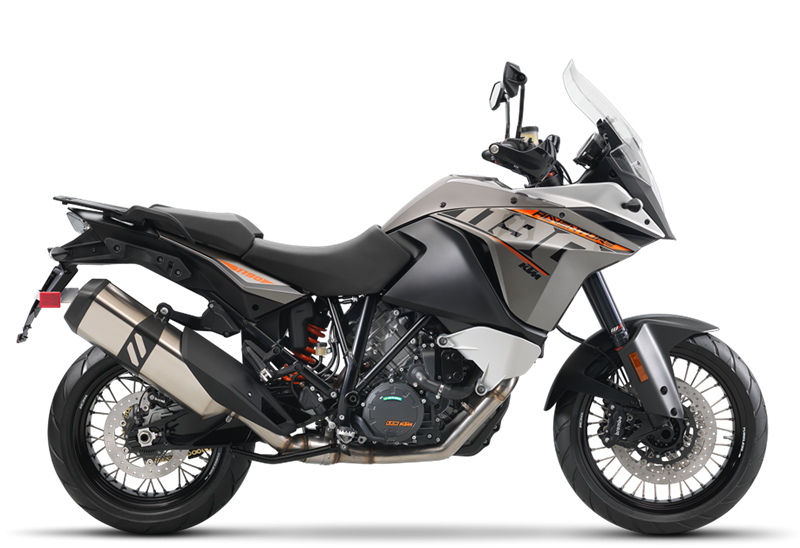 The rims on the 1190 Adventure combine all the benefits of a tubeless tire (easy fitting and dynamic advantages due to no inner tube) with the stability and robustness of a wire-spoked wheel. This set-up makes the Adventure's rims substantially more resilient than all the competition's cast and spoked wheels – an added bonus, especially in hard offroad riding. STEERING DAMPER With so much propulsive power, the front wheel can become very light, which can quickly lead to unpleasant kick-back on uneven roads or following a slight stimulus at the handlebar. The Adventure prevents this safely with a reliable and sensitive WP steering damper. 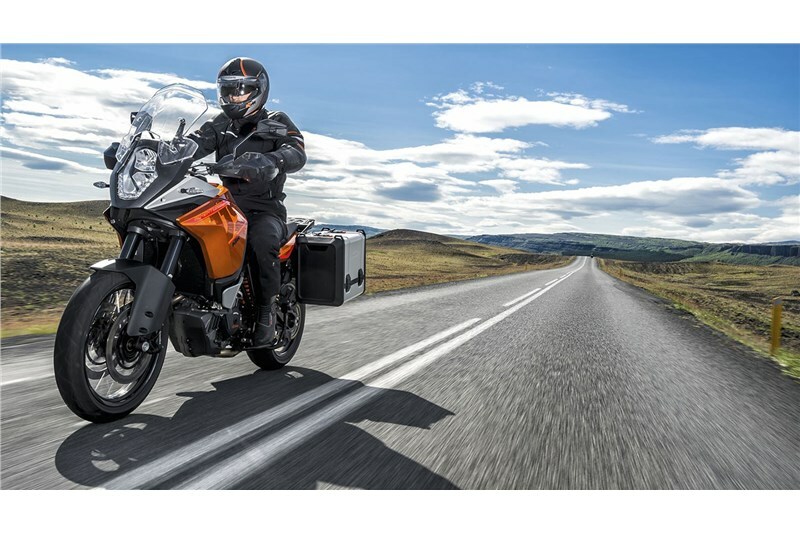 POWER-TO-WEIGHT RATIO The outstanding combination of lightweight engineering in the chassis and likewise very light and extremely powerful engines make the KTM 1190 Adventure top of its class in terms of power-to-weight ratio and ride dynamics. 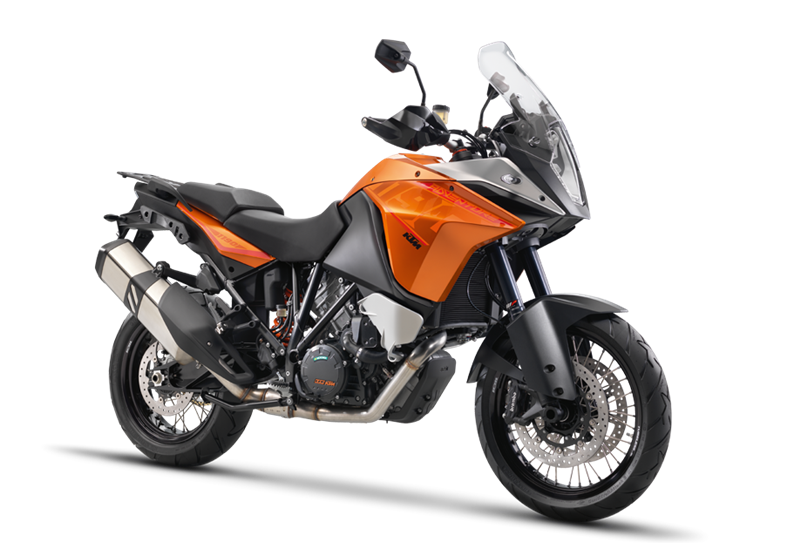 Its weight of only 230 kg, fully tanked with a substantial 23 litres of fuel, makes the 1190 Adventure – in typical KTM manner – one of the lightest motorcycles in its segment. Further reasons for the fantastic ride dynamics are the outstanding geometry, the very well-balanced stiffness distribution and the high quality of suspension components used. These ingredients not only result in nimble handling, but also in a boost to safety, since it is far easier to guide a lightweight motorcycle around a source of danger than a heavy one. BRAKES Precise application, powerful and free from fading: More than adequate deceleration is ensured on the 1190 Adventure by Brembo brakes with the very finest components, such as 320 mm brake discs, radially mounted, four-piston fixed callipers and a radial hand pump. At the rear, the braking energy flows into a generously dimensioned 268 mm disc. And not to forget: everything supported by Bosch 9ME C-ABS. MSC WITH C-ABS (COMBINED ABS) AND OFFROAD MODE The ultimate in safe deceleration: One component of the comprehensive Bosch MSC assistance package is the world's first lean-sensitive cornering ABS. Based on the high-quality 9ME modulator, it unites the talents of combined braking and lightning-quick, efficient pressure modulation with the high quality Brembo hardware to make the most advanced braking system on the market - no-one brakes more progressively or safely. Benefits and properties of MSC-ABS: » Safest and most effective deceleration on the market - even at extreme angles (optional) » Extremely short braking distances » When the front brake lever is actuated, the rear brake is always applied purposefully in parallel in order to optimise ride stability when braking » If required, not only can it be switched off, but also placed in offroad mode » Complex computation algorithms contribute to the prevention of endos Offroad mode: Offroad mode allows the rider to block the rear wheel as and when required - a prerequisite for committed offroad riding and deliberately executed slides. The ABS function remains active on the front wheel, even in offroad mode. TPMS (TYRE PRESSURE MONITORING SYSTEM) As its name implies, the optional TPMS monitors tire pressure (visible in the display) and warns the rider in the event of pressure loss, for example due to tire damage. MTC (MOTORCYCLE TRACTION CONTROL) As an integral part of the MSC package, MTC (Motorcycle Traction Control) also regulates subject to the angle of lean. It guarantees sporty yet completely controllable propulsion on all surfaces. Its intervention is indicated with a flashing LED in the VDO multi-function display. Depending on the engine mode selected by the rider, MTC permits differing levels of rear-wheel slip. Overall, MTC therefore offers four different characters (plus OFF), selected using the multifunctional switch on the left handlebar grip. Developed in close collaboration with Bosch, it reacts in a matter of milliseconds if the rear wheel begins to rotate too rapidly for the riding conditions. It also makes use of the quick intervention time of the ride-by-wire system to reduce propulsion to a safe level, subject to the angle of lean. Depending on the MTC mode, the EMS (Engine Management System) also makes available a suitable level of power – for example, "only" 100 instead of 150 hp in rain mode. Four different MTC modes are activated by changing the engine modes: » Sport: Something for the courageous to try: Allows a respectable and perceptible amount of slippage - drift-feeling all-inclusive! » Street: Smooth control for comfortable, undisturbed riding with full engine power. » Rain: Early intervention and minimum slippage in the wet, with engine power reduced to a maximum of 100 hp. 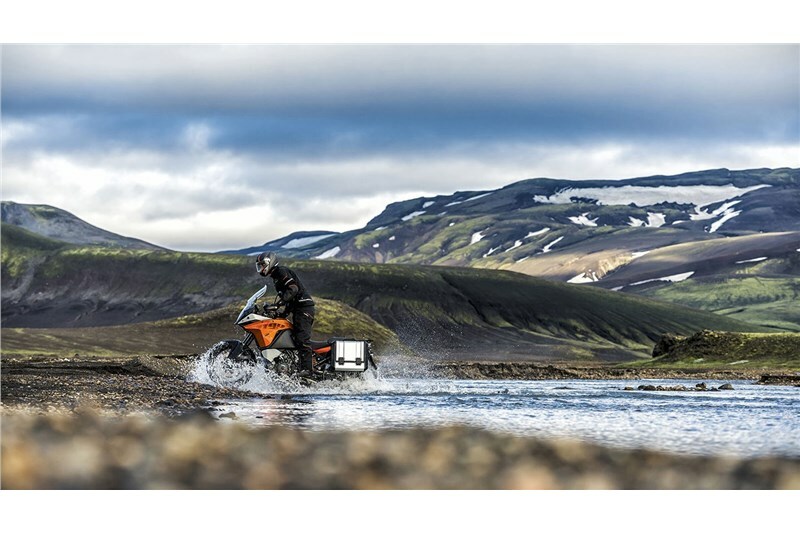 » Offroad: Up to 100 per cent slippage - i.e. double wheel speed - for ambitious offroad use. Have a go at controlled offroad drifts, with engine power reduced to a maximum of 100 hp. » Off: Those who know better than the MTC can enjoy maximum propulsion at all times, completely to their individual tastes, without electronic assistance. 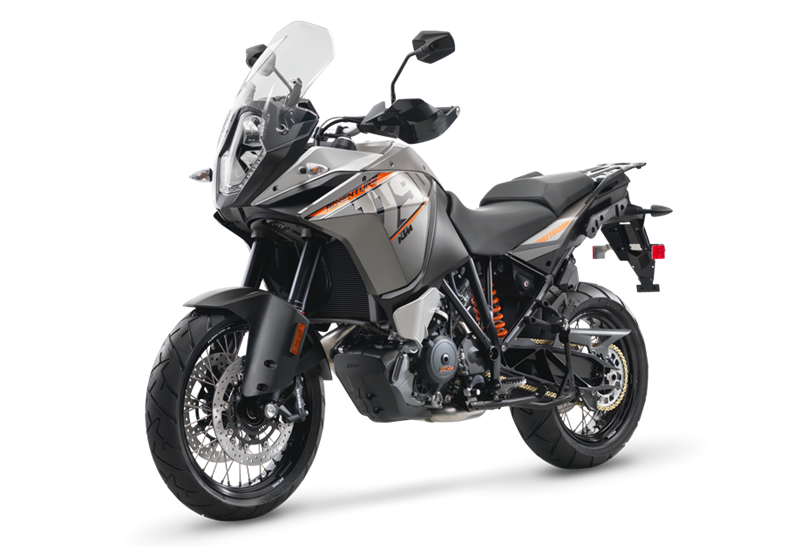 PRICE / PERFORMANCE The KTM 1190 Adventure is light, powerful and extremely controllable.. Thanks to low fuel consumption, a 23-litre fuel tank and long service intervals of 15,000 km, it hardly ever needs to take a break. LONG SERVICE INTERVALS A unique mix of the highest quality components combined with a fully developed and reliable engine allows extremely long service intervals of 15,000 km. ADJUSTABLE WINDSHIELD The height of the windshield can be varied individually as desired or to suit the rider's stature in next to no time with the easily operated champing mechanism (+25 mm). 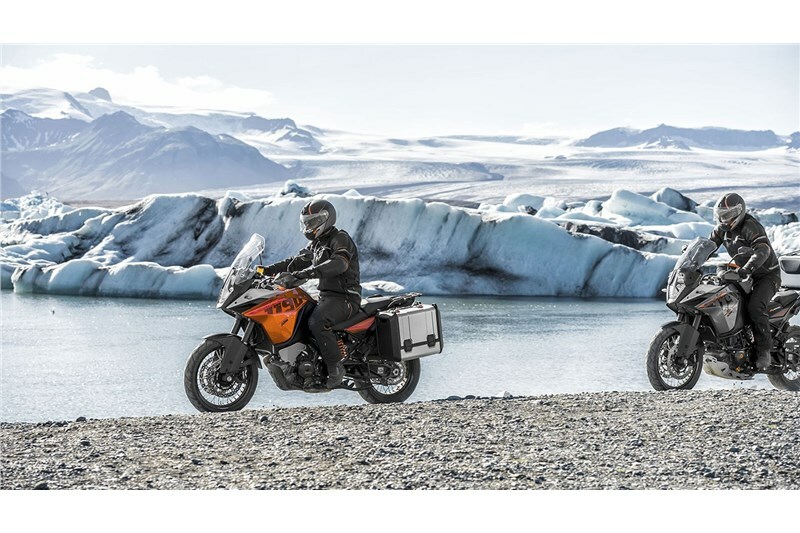 FIELDS OF USE The field of use of the 1190 Adventure extends smoothly from pleasurable touring comfort to uncompromising acceleration. This extremely wide application range is made possible not least by the first ever deployment of a ground-breaking electronics package. What's particularly impressive is that the bike's different characters lead to virtually no perceptible compromises. So those who use the Adventure for relaxed locomotion don't feel any of the sportiness at their disposal (for example, due to sharp responsiveness or a taut chassis set-up). Those who ride more sportily don't have to put up with a rocking horse. The many riding modes naturally support the user's tastes as well. 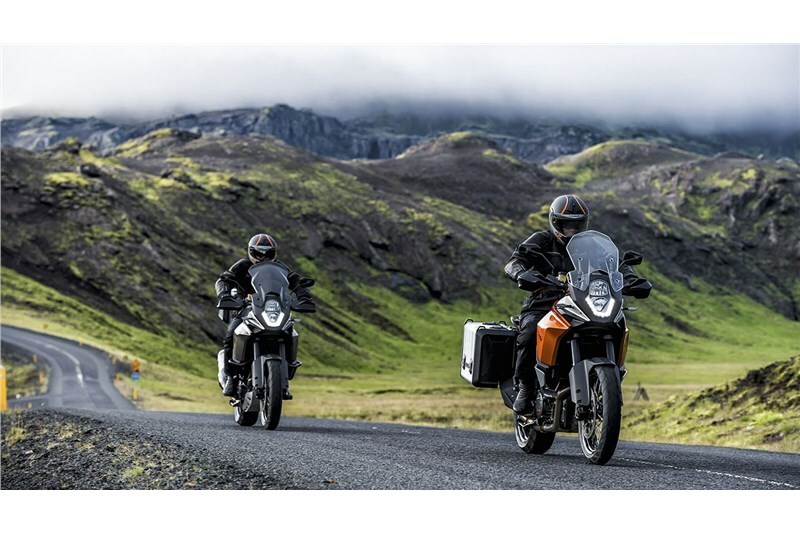 Whether it be alpine pass or coastal road, motorway or bone-shaking track, winding curves or urban jungle, the 1190 Adventure is the ultimate travel enduro for adventures on all the world's roads. SEAT The height of the rider part of the two-piece seat can be adjusted by 15 mm. Thanks to its state-of-the-art 3D foam padding, it also provides more comfort over longer periods and a better feeling for what's happening at the wheels - an orthopaedic benefit from tourers for tourers, from sportsmen for sportsmen. From MY 2015 on, KTM uses new foam that feels softer but offers much more consistency. So, no matter if the ride was short or very long, the rider and passenger reach destination in comfort. Due to new luggage case mounting from the side, the passenger handles are placed lower and provide more generous space and comfort.